Searching for Answers: God intervened in HIV cure of baby, Hannah Gay believes. 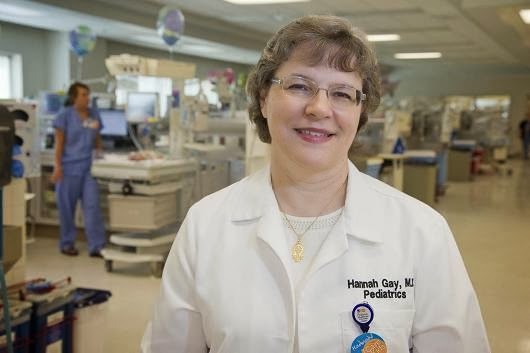 Pediatrician Hannah Gay says "And it was God that cured the baby and I just happened to be standing close by at the time." Gay, an associate professor of pediatric infectious diseases at the University of Mississippi Medical Center, was first credited in March with achieving a "functional" cure of the child, indicating the viral presence remained in the child but was no longer replicating. The viral presence was so low it could only have been detected by ultrasensitive methods, but not the standard clinical tests. Gay treated the child, born to a mother who received no prenatal care, with an unprecedented, aggressive regimen of three anti-viral medications within 30 hours of birth three years ago. The mother discontinued treatment of the baby after 18 months, but when she returned the baby for treatment at 23 months tests revealed that the virus had not been replicating. Gay has been in the spotlight for months because of the achievement. She presented a case study of the baby on Nov. 5 to the prestigious Oxford Union in England, a forum for debate and discussion at Oxford University which has hosted an array of notables, including world leaders, since 1823. The case gives Gay opportunities to share in general terms her faith in God, she told Baptist Press, and is further maturing her as a Christian. "I think He's teaching me submission with all of the speaking business. I don't particularly like that, but it is an opportunity for me to be able to say ... when I treated this baby I was not even thinking of curing the baby. That was the furthest thing from my mind. I was simply trying to prevent infection and I failed at what I was trying to do," she said, seeing failure in her inability to keep the baby from being born HIV-positive. "However, my failure in God's hands turned into a miracle. And it was God that cured the baby and I just happened to be standing close by at the time." The pediatrician, who served six years as a Baptist medical missionary in the Horn of Africa 20 years ago, said she doesn't know why God is using her for such a public task as breaking barriers in the cure of pediatric HIV. "I still have no idea why He picked the shiest pediatrician in America to do this, but I suppose I'll find out in heaven," she said. "I am by basic nature very shy. And fortunately I have a husband [Paul Gay] who is very outgoing and well-spoken. So in most cases I depend on him to do the talking. But the problem is in this particular case, he's an accountant and he knows nothing about pediatric HIV disease." She and her husband continue to teach Bible drill at Trace Ridge Baptist Church in Ridgeland, Miss. A sermon her pastor Steve Street delivered in March, shortly after Gay was credited with achieving the functional cure, reminded her of Moses' reticence for the spotlight. "And then God proved to Moses that He can use just a stick to get water from a rock, or to part the Red Sea, or whatever. So with Moses protesting all along the way, 'God I can't talk,' God sent him anyway," Gay said. "I have felt very much like that and I can't tell you that I'm happy with the idea of having to be the one on the speaker's stage all the time. I'm still not happy with it, but there have been a lot of things that I have learned," she said. "Yeah, I can't talk but God is providing words." Still, she has welcomed venues in Mississippi, where she's using the platform to encourage prenatal care. "I've been able here in Mississippi, in my own backyard, to really promote the prevention and get the message out there [that] all women need to get ... prenatal care. They need to be tested for HIV during every pregnancy and, if positive, they need to be treated," Gay said. "So I'm giving the prevention message out here in Mississippi and that's something that I've wanted to do, because we're much more interested in preventing HIV rather than curing it." Gay continues to monitor the child, whose identity has remained anonymous, and sends samples of the patient's blood to labs of her colleagues for ultrasensitive studies. "I see the child on a regular basis, but several times a year I will be continuing to send samples of her blood to their research labs so that they can do these ultrasensitive tests," Gay said, "and in that way I'm better able to maybe get some early indication that, yeah, her virus may be getting ready to come back. And if that's the case, then I'll know to start medicines right away. But hopefully it's not going to happen." Deborah Persaud, a virologist and pediatric HIV expert at Johns Hopkins Children's Center, is chairman of the cure committee of the International Maternal Pediatric Adolescent AIDS Clinical Trials Network that will conduct a trial in early 2014 to determine whether the early, aggressive treatment of pediatric HIV can be termed a cure.